​​The IPCC assessments are most important to understand because it is only the IPCC assessments and only the Summaries for Policy Makers (SPMs) in the assessments that are recognized by policy makers and governments for climate change science. The assessments, since the first in 1990, have been the climate change science resource for governments to implement the clear intention and terms ​​of the 1992 UN Framework Convention on Climate Change. ​​Article 2 of the UNFCCC explicitly acknowledges the importance of natural ecosystems, food production, and sustainable economic development (IPCC 1995). This page includes the food security sections ​​from the SPMs of the 1990, 1995 and 2001 assessments. From the very start the assessments have reported that from research global climate change ​​would affect and regional agriculture. Lower latitude and arid regions would suffer production losses and that NH mid latitude regions could benefit with increased production this century. The conclusion has been that world food production would be maintained under global climate change. It is disconcerting to realize that these conclusions have been based on very inadequate research. 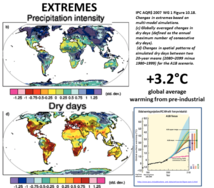 The 2007 IPCC 4th assessment ​​includes a long list of adverse climate change impacts not captured by the climate-crop computer models. From 1990 to 2001 ​​the governments of the rich NH nations (the countries responsible for the vast majority of the atmospheric GHG pollution) have been led to believe that they did not have to be concerned about their own food security, though they should have been concerned about the food security of those huge populations that already are vulnerable to episodic large crop losses and the most socio-economically deprived populations. It is by now generally realized, from the media reports, that ​​​large populations in the lower latitudes and Africa are going to suffer crop yield losses from global climate change. This has led to to the climate justice movement. 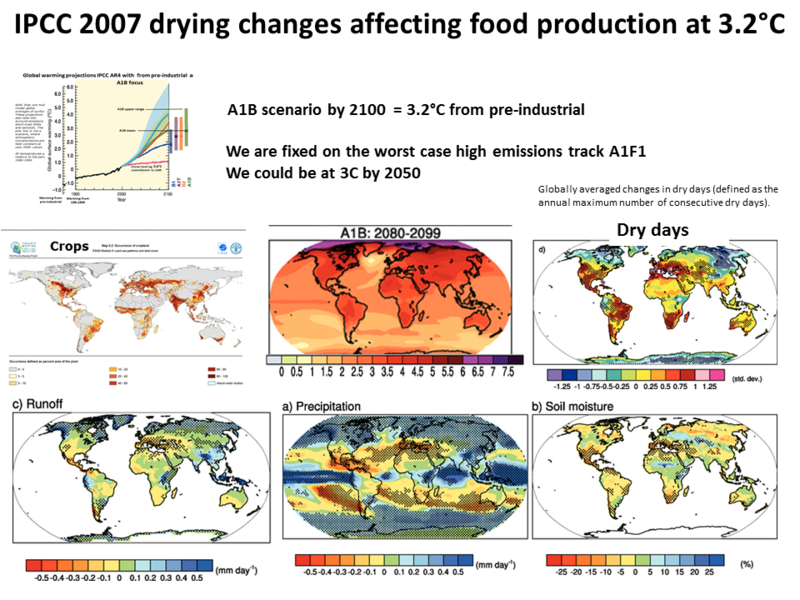 When the IPCC food assessments refer to studies or research it means computer model projections of future climate change and ​​model projections of how this will affect crop yields. Just a few cereal foods have been studied. There are relatively few studies on the most climate change vulnerable regions. 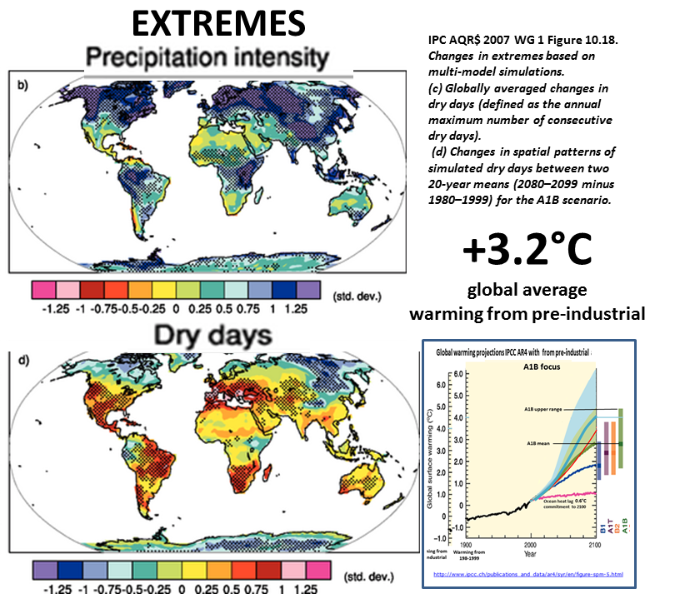 The model projections of how fast the world will warm remain very uncertain for the upper range of possible global temperature increases, very uncertain ​​of hydrological changes, and very uncertain of the regional changes. 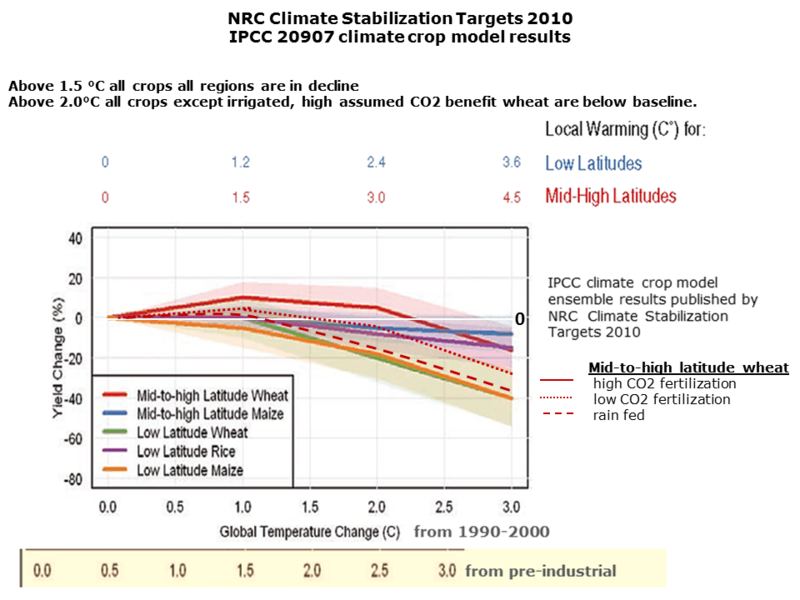 Even today the climate crop models do not capture a large number of large adverse effects of global climate change on crops. The terrible thing is that the rich heavily industrialized nations have, and and still are, ​​sabotaged any progress towards reducing emissions or assisting the developing and most vulnerable populations. This remains the case even though the clear intention and terms of the 1992 UN climate convention requires these nations to do both. ​​There may be severe effects in some regions, particularly decline in production in regions of high present-day vulnerability that are least able to adjust. achieving this is unclear. Nonetheless, climate change may intensify difficulties in coping with rapid population growth. Agriculture. Crop yields and changes in productivity due to climate change will vary considerably across regions and among localities, thus changing the patterns of production. 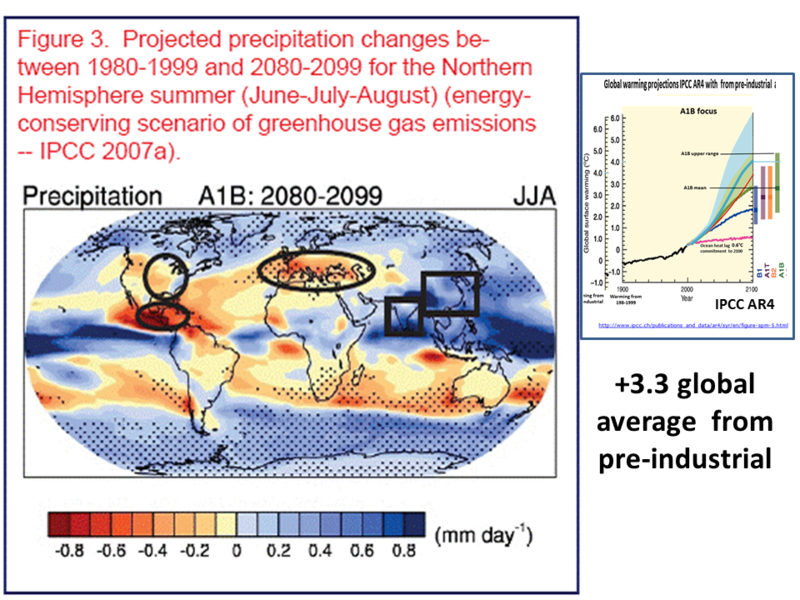 Productivity is projected to increase in some areas and decrease in others, especially the tropics and subtropics. 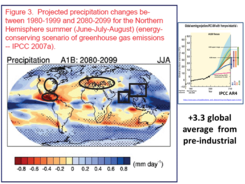 ​​However, existing studies show that on the whole global agricultural production could be maintained relative to baseline production in the face of climate change modeled by general circulation models (GCMs) at doubled equiva- lent-COj equilibrium conditions, but that regional effects would vary widely. This conclusion takes into account the beneficial effects of CO2 fertilization, but does not allow for changes in agricultural pests and the possible effects of changing climatic variability. Based on experimental research, crop yield responses to climate change vary widely, depending upon species and cultivar; soil properties; pests, and pathogens; the direct effects of carbon dioxide (CO2) on plants; and interactions between CO2, air temperature, water stress, mineral nutrition, air quality, and adaptive responses. Even though increased CO2 concentration can stimulate crop growth and yield, that benefit may not always overcome the adverse effects of excessive heat and drought (medium confidence6). These advances, along with advances in research on agricultural adaptation, have been incorporated since the Second Assessment Report (SAR) into models used to assess the effects of climate change on crop yields, food supply, farm incomes, and prices. Costs will be involved in coping with climate-induced yield losses and adaptation of livestock production systems. These agronomic and husbandry adaptation options could include, for example, adjustments to planting dates, fertilization rates, irrigation applications, cultivar traits, and selection of animal species. 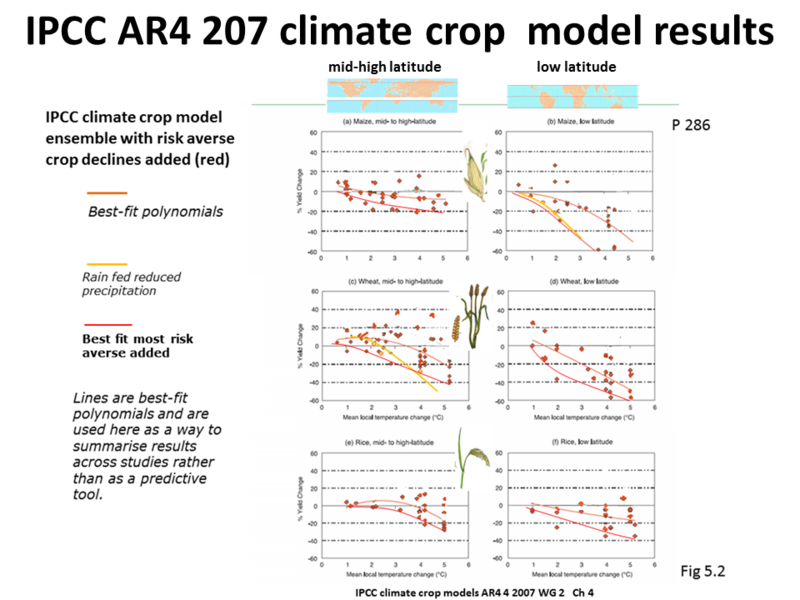 When autonomous agronomic adaptation is included, crop modeling assessments indicate, with medium to low confidence6, that climate change will lead to generally positive responses at less than a few °C warming and generally negative responses for more than a few °C in mid-latitude crop yields. ​​Similar assessments indicate that yields of some crops in tropical locations would decrease generally with even minimal increases in temperature, because such crops are near their maximum temperature tolerance and dryland/rainfed agriculture predominates. ​​Where there is also a large decrease in rainfall, tropical crop yields would be even more adversely affected. With autonomous agronomic adaptation, crop yields in the tropics tend to be less adversely affected by climate change than without adaptation, but they still tend to remain below levels estimated with current climate. 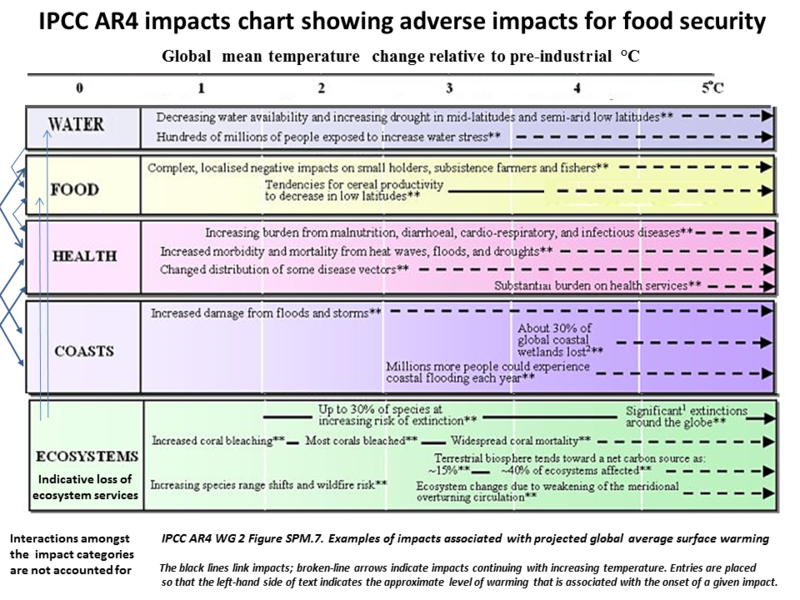 ​​Most studies indicate that global mean annual temperature increases of a few °C or greater would prompt food prices to increase due to a slowing in the expansion of global food supply relative to growth in global food demand (established, but incomplete6). At lesser amounts of warming than a few °C, economic models do not clearly distinguish the climate change signal from other sources of change based on those studies included in this assessment. Some recent aggregated studies have estimated economic impacts on vulnerable populations such as smallholder producers and poor urban consumers. These studies find that climate change would lower incomes of the vulnerable populations and increase the absolute number of people at risk of hunger, though this is uncertain and requires further research. It is established, though incompletely, that climate change, mainly through increased extremes and temporal/ spatial shifts, will worsen food security in Africa.